You will be mentored by the best property investment experts in Australia and learn the best strategies to achieve outstanding results. More than that, you are joining a vibrant community of investors for advice, friendship, joint ventures and partnerships. They laughed at me when I said I was going to replace my income and become a real estate millionaire in 3 years...But then I did it in just 18 months! "The information is invaluable for anyone who owns property and those who want to invest in property. The economic, insurance and financial elements that are relevant are covered in a succinct manner"
Despite what 99% of the population thinks, there are still areas in Australia where you can find positive cashflow properties. But be warned! 80% of those properties are not what I would call “investment opportunities.” You need to be able to recognise exactly what makes a positive cash flow property a good long-term proposition. You’ll get to be an “EXPERT” You’ll know every secret there is… And how to use them!! Discover why negative gearing is a dumb idea... and if you follow it, why it will keep you hand-cuffed to a JOB for the rest of your life... YUCK! Discover how to create your own mini property boom in the next 12 months regardless of the economic climate. OK, this strategy works really well in a slow market. Why? Because it gives you the opportunity to get access to deals that were simply too expensive a short while ago. Now considering a property boom is returning about 12% per annum, in this section I’m going to show you how you can return around 20-30%, consistently. How to create HUGE capital gain with subdivisions, planning permits, development approvals and zoning changes. (You don’t have to be a developer or builder to do this. This is how the big boys make millions of dollars). How to secure and control property with very little money out of your pocket, using professional option clauses in contracts. Australia is closely behind the “Sue-Happy Yanks” when it comes to litigation, in fact NSW is third behind California and Texas for legal suits and Queensland and Victoria are in the top ten. So do you have a “Bullet-proof” lawsuit protection in place for your personal assets to guard against such frivolous types of lawsuits? Never again waste another minute worrying about losing your house, bank account, investment, business, etc to an unethical lawsuit? See greedy, hostile litigation attorneys stop salivating and turn pale when you explain to them your asset protection strategy. Barricade your assets with an impenetrable fortress where they are creditor proof, lawsuit proof and judgment proof forever. You’ll learn my tailored Asset Protection secrets that are tested, proven, legal tools. These tools are the most successful and thoroughly explained in Plain English. Legal and ethical tax secrets of the rich that can massively slash your tax burden. For the average Australian, taxes are the single largest bill they will pay. Almost 50% of every working person’s wages go to taxes. On top of that, you’ve got utilities, rent, car loans and education expenses. So what has been the solution until now? Working harder and earning more money. The problem with that is you end up paying more tax. It sounds unfair doesn’t it? For most people earning money equals paying more taxes! Now, do you know anybody in the Tax Trap? You might even know them intimately. Most Australians don’t realise that the ATO have got a hand in your wallet and because of the small size of the deductions such as state taxes, federal taxes, Medicare, petrol taxes, land taxes and on and on it goes, you just cop it sweet. Own an older investment property? That doesn’t mean you’re not entitled to building depreciation. The type of structure you should NEVER have for an investment you expect to increase in value. Only 75% of the room is set aside for the free tickets. Don’t miss this opportunity. Click the 'Register Here' button or pick up the phone and call (03) 9490 8888 during business hours. Achieve life-long financial freedom through The Ultimate Real Estate Success Program, the foundation of all my real estate investing success programs. You will discover the strategies, techniques and structures you need to successfully invest and prosper from Australian real estate. In addition to the education, you will become a member of the I Love Real Estate Community and gain access to my nationwide team of highly trained experts who will support you in your wealth journey and beyond. This community comprises over 7,391 students who are available for networking, advice, friendship, joint ventures and partnership. These contacts and “mates in the market” are your support network to your successful future. 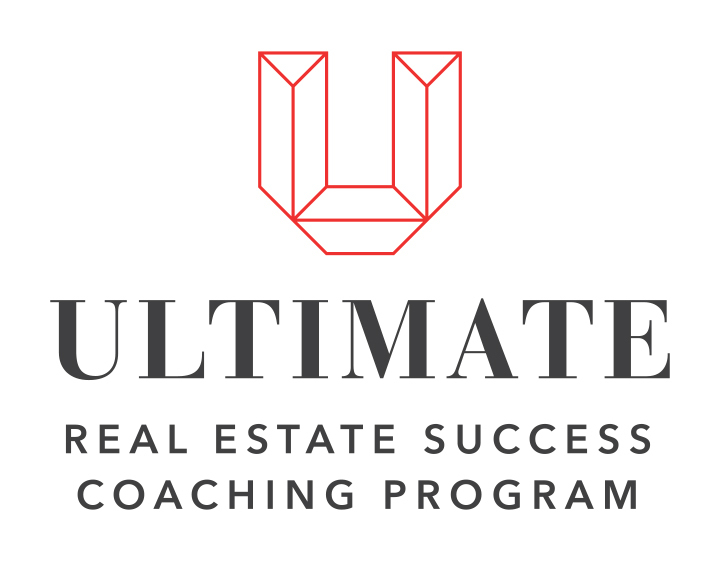 What’s In The Ultimate Real Estate Success Program? Plus boot camp recordings, an appendix of investment terms, useful forms and much more. This is an intensive learning environment, where we go through my A-Z blueprint for real estate success. I also bring my finance, legal and account team to support you at these events. You’ll get a general admission ticket to my Annual Conference. At this event, the smartest research analysts and high-profile special guests explain how to get more from every deal. It’s also a place for the community to get together and help each other. Maximise your Self Managed Super Fund to allow you a comfortable retirement using the latest strategies and tactics to create maximum leverage. Discover the latest legal and compliance requirements to be sure your SMSF is bulletproof. Leverage your new found knowledge and do deals even if you are struggling with a deposit or can’t get a bank loan. You’ll receive all the documentation and the process to present deals that become attractive to money partners. All course materials are available online as well as our Renovation Checklist, podcast archives, past event recordings, reference guides for property investors, a comprehensive FAQ section and an extensive list of downloadable guides. Access resources for Finance, Joint Venture Agreements, Public Trustee Auctions, Portfolio Analysis, Grid Variance Analysis and much more. We have a dedicated team of experienced real estate coaches ready to provide support and answer any of your questions. All members come together, share ideas, ask questions, connect with local members and create potential JV partners. Our new app allows you to access the entire members website and all the course content while you are on the go, from your mobile. All of our courses come with an unconditional guarantee. If you don’t absolutely love the course content and believe they will assist you in growing your wealth, you’re entitled to 100% of your money back, no questions asked! Four times a week you can get updated on a variety of trends, topics and support and opportunities delivered by our community of professionals, coaches and experts. This proprietary software will walk you through every aspect of a potential real estate deal to determine whether it’s going to be profitable or not based on your specific outcomes. If you want a ﻿﻿better ﻿﻿deal or to find out more about the Ultimate program then attend one of our live events or book ﻿﻿into ﻿﻿one of the regular webinars (where Dymphna will offer you a special price). If you can’t wait and want to get started right now, then click the 'Buy Now' button or pick up the phone and call (03) 9490 8888 during business hours. 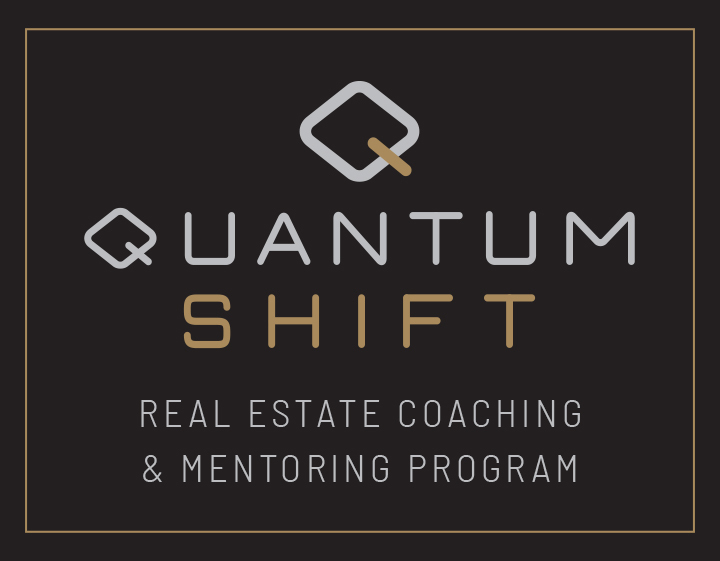 The Quantum Shift Real Estate Program is a world class training, coaching, and continuing education, consisting of live educational events, digital and online training modules. 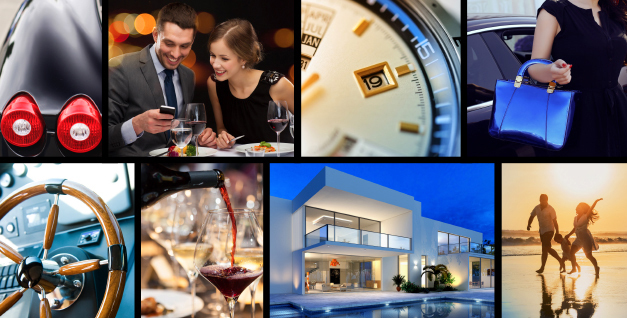 Quantum Shift includes the complete Ultimate Real Estate Success Program plus all the tools, strategies and resources in our online Quantum program will blow your mind. I’m that confident in our world class training, coaching, and continuing education. I also want to say that this is not a 24 month program. You are a lifetime member, so as strategies change, as legislation, hot spots, building techniques change over time you’ll be able to keep up to date. This means that you remain part of our vibrant community of investors. I’ve got students that are still coming back and finding value 8 years later as their property journey continues. What’s In The Quantum Shift Coaching & Training Program? This is the gala event of the year where all members come together and collaborate, network, learn the latest and greatest strategies, case studies of what’s working right now, plus all the latest economic and property cycle research on the Australian real estate market. The fast-profits system and strategies that enabled an investor to create $150,000 passive income in 13 months. Learn how to create cash flow and growth simultaneously at the Fast Profits 2-day Bootcamp. This complete training is available online. Learn the income-replacement systems and tactics for the next 12 months. You’ll get professional analysis on the top 21 resource towns in Australia. Includes the Extreme Income System 2-Day Bootcamp and the complete home study course. You’ll be able to access all the education regardless of where you are, in the car, at the gym, on holidays - it comes with you. Expect your mastery and results to accelerate when you emerge yourself in our I Love Real Estate - Education On Demand app and closed, members only Facebook group. At this intensive 2-day bootcamp you will learn how to enter the profitable world of property developing. Discover how to create wholesale property forever, how to fast-track your real estate portfolio using the 25% principle and get the A-Z guide on project managing your developments. 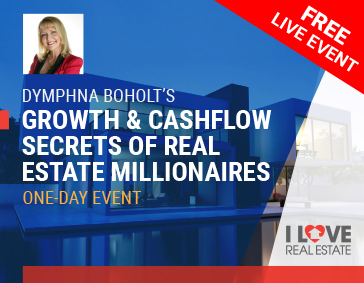 At this exciting event you will learn how to achieve amazing cashflow investing in commercial property. A live 2-Day Event. Discover how to generate higher cashflows and returns investing in the USA property market safely. Generate an impressive NET cashflow of up to 15% per annum and capital growth of up to 25% in your first 12 months. *If you would like a better price then register now to attend one of our live one-day training events. Presented by Helen Tarrant – Australia’s Queen of Positive Cashflow. Helen used to work long hours as a beauty therapist in Sydney. And when she came home at night, she was dog-tired. Things got worse when she was starting a family. So, she decided to replace her working income with income from property. She tried investing in residential property – but the yields were simply not high enough to replace her income. She got a few hundred dollars a month, not much growth and had big tenant issues. So, she dug a little deeper, and found she could get much greater cashflow investing in commercial properties – while having secure tenants on longer leases. Another huge advantage in commercial property is that she could “set it and forget it”. Because she didn’t need to deal with the tenant issues that can come with residential property. So, she began to look for commercial properties that generate massive cash flow, with long term tenants on secure leases of 3 to 5 years or more. And the difference it made to her cashflow was staggering! Through choosing the right sort of properties, she’s created a passive income of over $206,000pa. Now she lives her dream life with her husband and son Max on the North Shore of Sydney. 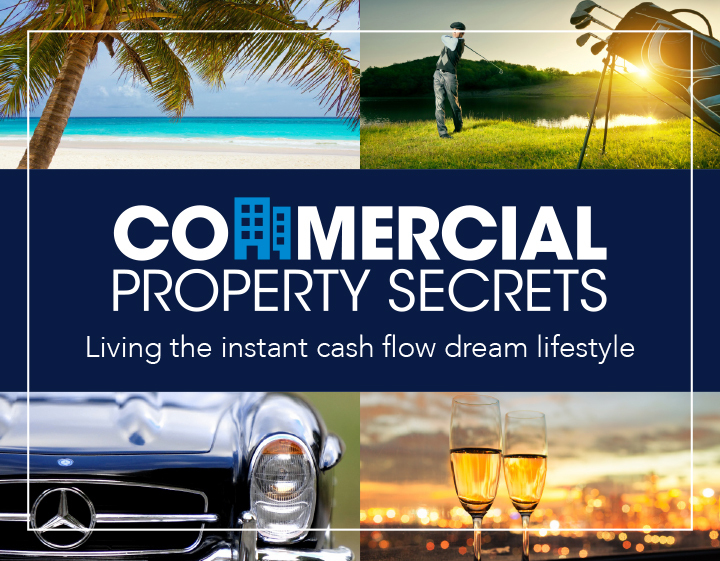 What’s In The Commercial Property Secrets Program? * To get a better price, just attend one of Helen's regular online training webinars, he will make you a special offer. Call (03) 9490 8888 during business hours or click the 'Buy Now' button to apply to join this exclusive community of commercial property investors. Jason and Amy’s very first development created over $1,000,000 in profit (shared with a joint venture partner). 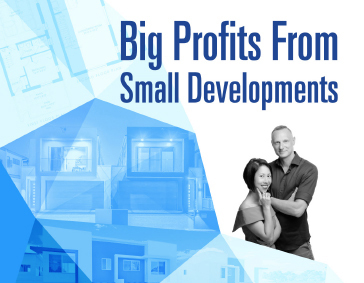 What’s ﻿﻿In The Big Profits From Small Developments Program? The Live 3-Day Forum where we cover the entire system and training in detail. Here you can ask questions, get real life examples and meet your tribe. This will give you access to our exclusive Members Only Community where you can get your support questions answered, meet other developers for support, inspiration and joint ventures. These will be live, Interactive Webinars where you can get your questions answered in detail. We will also use this time to dive into specific topics in depth. This is a chance for us to show you, from the trenches, the developments we are doing as well as real-life deals students of the program are doing. Jason & Amy offer a special deal to those that attend their regular online webinar or go to one of their evening live events around the country. If you want to access their training material and become part of the mastermind community right now then call (03) 9490 8888 during business hours or hit the 'Buy Now' button. Cutting-edge, hands on, dynamic one-on-one 12 month mastermind coaching program, designed to ﻿bring﻿ together an exclusive group of real estate millionaires. By invitation only. The Platinum Accelerator program has been carefully crafted by Australia’s leading property experts. Success is not an accident. Achievement of your goals is a systematic process. When you follow this process you will see how each step builds on the one before. We know it will eliminate inefficiencies in your process, as well as guarantee a success blueprint for you to follow regardless of your starting point or your desired end destination. You will be formulating your own goals, your own plan and your own strategies, and ultimately, your own success by following the Platinum Accelerator program.